Right by the trendy shops and galleries of Queen West, but just far enough from the city noise! Queen street west is one of the trendiest areas in Toronto, with many art galleries, restaurants and shops. 2 bedrooms with queen size beds, hardwood floors, washer and dryer, and dishwasher. Full kitchen. This is a separate apartment, part of a large house with other units. You may hear footsteps from the staircase going to the unit above. Guests must be over 25 to book, and must provide ID upon check-in. No smoking of any kind inside the house, otherwise a minimum $200 cleaning fee will be deducted from the damage deposit. Should have heeded the warning in a previous review. Visited during Caribana which was our first mistake but that probably would have been fine if we stayed elsewhere. Seems like the occupants of both the unit above and below were here exclusively to party - with literal dance parties and loud conversation until the early morning hours each of the 4 night’s we stayed. The neighborhood was funky and fun with great restaurants within walking distance and cheap Uber ride to attractions and the apartment was generally fine but not for a family of 4 that wasn’t planning to stay up all night. Great location, clean, well appointed space in charming building. Everything’s as promised. 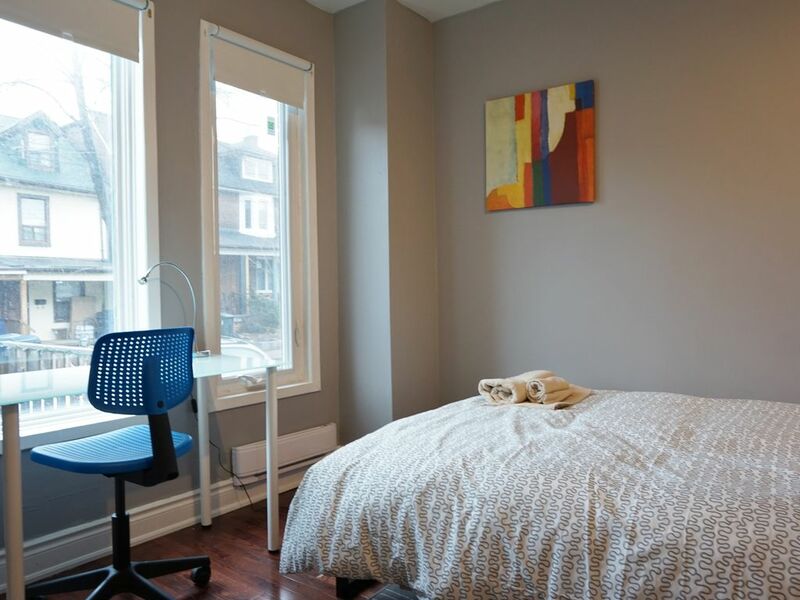 A great space in a fun neighborhood not far from the park or Kensington Market. We hope to be back! A trip back to visit old friends after 17 years. Dissapointed with accomodation. Poorly built extension on the side of an old house. Very noisy permanet residents above and below, home late, parties, banging around. Almost impossible to sleep.No natural air in one bedroom. The window opens into entrace way by front door and not on an outside wall. No TV. Only Netflix and the re were constant problems trying to connect. Luckily I was out most of the time so did not have to be in the apartment. A long way from the city when walking. About 15 dollar cab ride to CN tower area. Queens West is a mix of cool bars and homeless. Quite like Queen West area. Internet worked OK.
OK apartment if you are not bothered about high quality. I expect more from my accommodation. I made a mistake booking this and both my friend and myself would not stay here again. My two kids and I visited Toronto for a few days and stayed at Angela's place. We found the neighborhood to be very convenient to all kinds of restaurants, shopping, walking around and people watching. We ended up renting bikes several times which were conveniently located around the corner. This appartment is quite well situated to visit Toronto, in a nice neighborhood, close to Little Italy and not too far from downtown center. It is also well distributed , clean and comfortable. Very nice too to use the little terrace in front of the building. But a few issues remain: first, communication with the owner/manager of the property has been very bad, an we have feared quite a time that we were screwed up - money was transfered without confirmation of the reservation, no address ,and no telephone received- a very bad moment during our vacations! fourth, this is a comfortable appartment for 4 persons with two bedrooms, apart the fact that ther is only a very small table for 2 to eat your breakfast: please use the available space to install a larger table with 4 chairs!